Jack Went A-Sailing. William Taylor. Johnson Boys. A Frog He Went A-Courting. The Green Willow Tree. Boney's Defeat. Earl Brand. Sugar Babe. Barbara Allen. Play Party Medley. The Gypsy Davey. The High March/Matches Under the Hill. Edward. The Foolish Boy. The False Knight Upon the Road. Hold On. Awake! Awake! The Silk Merchant's Daughter. Sweet William. The House Carpenter. My Sad Overthrow. The Handkerchief. Lady Marget. The Boatsman and the Chest. Lord Thomas and Fair Ellender. Lady Isabel and the Elf Knight. Jimmy Randal. Your Sins Will Find You Out. On one occasion, when I went to see the Virginian singer Dan Tate, Dan asked if he had sung his version of Jackie Frazer to me. "It must be about England, Mike, because she sends for a London doctor to heal up his wounds". And that same London doctor appears in the opening track to the CD Sharp's Appalachian Harvest, an album that is sub-titled 'A selection of traditional songs and music from the collection made by Cecil Sharp in the Appalachian Mountains between 1916 and 1918'. It seems that there is now a growing interest in Cecil Sharp's Appalachian collection and this album, together with The Mary Sands Project, Volume 1, ably reflect this interest. 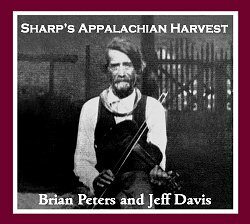 On Sharp's Appalachian Harvest Englishman Brian Peters has teamed up with the American Jeff Davis to give us a selection, a very small selection, of the types of songs and tunes that Sharp collected all those years ago. We all know that Sharp was looking for "English" songs from the Appalachian singers, but, as we also know, he did note a number of American pieces, such as Johnson Boys, Sugar Babe and Hold On, as well, and I am glad to see that some of these pieces are also included on this CD. But, the bulk of the material heard here does come, originally, from the Old World. The CD kicks off with good versions of two standard British broadsides, Jack Went A-Sailing and William Taylor. There is also a splendid version of another broadside, The Isle of Saint Helena, here titled Boney's Defeat, which Sharp collected from a pair of singer in Kentucky. The song was published on quite a few English broadsides though was hardly collected at all in Britain or Ireland (there are a couple of Irish sets, plus a tune that Vaughan Williams collected from the Sussex singer Henry Burstow, and that's about it! ), whereas versions have been found all over America and Canada. This may partly be explained by the fact that the song was included in a number of mid-19th century American Forget-Me-Not Songsters, and also, I suspect, by the fact that many Americans had quite an admiration for Napoleon, who was, after all, fighting Republican America's old enemy, England. The CD notes suggest that The Isle of Saint Helena may have started life in Scotland (it is thought to have been written by one James Watt of Paisley) although, judging by the song's classical allusions, Watt, if indeed he was the author, may have been influenced by Irish songsters. As I have said before, Cecil Sharp was a bit of a 'twitcher' when it came to Child ballads and there are versions of six of these ballads included here, The Green Willow Tree, Earl Brand, Barbara Allen, The Gypsy Davey, Edward and The False Knight Upon the Road. The Green Willow, a version of The Golden Vanity, was collected from Kentucky singer Polly Patrick when Sharp was suffering badly from ill-health, and I can only think that hearing such splendid ballads must have helped him on the road to a speedy recovery. Earl Brand came from the wonderfully named Philander Fitzgerald, a Civil War veteran, and was one of twelve versions that Sharp found being sung by the mountain singers. This heartened us considerably." The other version, the one sung here by Jeff Davis, came from Mrs Jane Gentry, the person who gave more songs to Sharp than any other singer. Mrs Gentry came originally from the Beech Mountain area of Watauga County, NC, and Jeff says that his singing of the ballad is based on the singing style of the Beech Mountain singer Lee Monroe Presnell, because Mrs Gentry "might have sounded like (him)". The False Knight Upon the Road, sung here by Brian Peters, is as fine a version as could be found and one set to a powerful tune. It came from Mrs Eliza Coates of Flag Pond in Tennessee on 1st September, 1916. Sharp had spent twelve hours song hunting that day - and had trudged over fourteen miles in the process - when he saw an isolated mountain cabin. I wonder if he thought about walking by, but, luckily, he did stop and found Mrs Coates and her ballad. I mentioned American songs above. One singer, Eliza Pace from Kentucky, gave Sharp the version of Sugar Babe heard here. Sharp liked Mrs Pace - "a great offender in retailing moonshine" - and when Alan Lomax visited her twenty years later she reminisced about "that English feller that come over the mountains years ago". And Sharp also collected a few fiddle and banjo tunes in the mountains. I especially like The High March and Matches (sic) Under the Hill, the former piece from Mitchell Wallin who sometimes acted as Sharp's chauffeur in Madison County, NC. Most versions of Natchez under the Hill, to give it its better-known title, sound rather like the tune Turkey in the Straw, but Mr W Julian's tune heard here is different. I have known Cecil Sharp's Appalachian collection for some fifty years or so, both in book and manuscript form, and it is a great delight to hear these songs and tunes being performed again. All praise then to Brian and Jeff for putting so much effort into this venture. Let's hope that other similar volumes will follow. When Cecil Sharp first visited the Appalachians he originally went to Madison County NC, where he found so many splendid singers, including Mary Bullman Sands of Allanstand, who gave him twenty-five "first-rate" songs and ballads. In 2002 I encountered Kris Sands, one of Mary Sands' grandsons, and, together, we wrote an MT article about Mary and her songs. 1 Madison County singer and resident Joe Penland read the article and began his own research into Mary Sands. 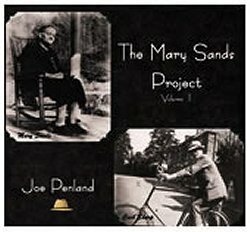 One result of all this was the suggestion that Joe should record all of Mary's songs and now we have The Mary Sands Project, volume 1 of a proposed three volume CD set. Volume 1 contains eleven old-world songs and ballads, together with a song that Mary Sands wrote, Your Sins Will Find You Out , about the death of one of her sons. One or two of Mary's pieces, such as Awake! Awake! and The House Carpenter are close variants of well-known songs and ballads. Others, though, are quite different. Mary had a long version of The Silkmerchant's Daughter, a song that seems to have once been highly popular with American singers, to whom the term "barbarous Indians" probably had great meaning. Mary's version of The Sheffield Apprentice (My Sad Overthrow) is also rather different, partly because it has become confused with the addition of verses from another song, The Boston Burglar. Interestingly, the song is set to a variant of the well-known Dives and Lazarus/Star of the County Down family of tunes. The final song, as opposed to ballad, is a lively version of The Boatsman and the Chest, just the sort of thing that Harry Cox or Sam Larner would have relished. What will you will to your sweetheart, Jimmy Randall, my son? What will you will to your sweetheart, my own dearest one? For she is the cause of my lying down. It has been said that collecting songs is rather like collecting butterflies. But it is not. Once a butterfly is pinned in a display cabinet then that is it - it will never fly again. But song collections are there to be used, so that the songs can live again. And I am certain that this was why Cecil Sharp put so much energy into collecting all those beautiful songs and ballads in the harsh terrain of the Appalachians. Brian Peters, Jeff Davis and Joe Penland are to be thanked for bringing these ballads, songs and tunes back to life again. These are wonderful collections that deserve to be heard, and are far, far better than some puerile rubbish that sadly appeared a couple of years ago in the form of songs such as Maud & Cecil and Veggie in the Holler. 1. Michael Yates & Kris Sands A Nest of Singing Birds. Cecil Sharp, Mary Sands and the Madison County Song Tradition, Musical Traditions article MT092. 2. Listen to Evelyn Ramsey's version of Lady Margaret for a more "standard" version of the tune. Musical Traditions double CD set Far in the Mountains volumes 1 & 2 (MTCD501-2).